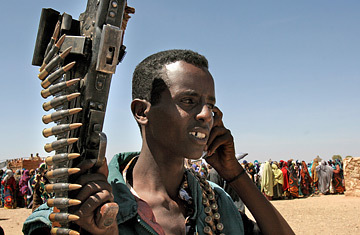 A Somalian militant talks on his mobile phone at a food distribution center. Downtown Mogadishu is a tropical Stalingrad, a bullet-raked, mortar-pounded, artillery-shelled canvas of Roman arches and Italian colonnades that that testifies to man's capacity for creation and also for destruction. Not the sort of place, in other words, that you'd expect to find a $30 million telecommunications concern doing a roaring trade in an ultra-competitive market. Yet, as Mustafa Sheikh, deputy managing director of Telcom Somalia says, the absence of a functioning government for 16 years has been a boon for private enterprise. His firm is one of three in Somalia that provides fixed-line and mobile phones, creating competition so fierce that rates are among the lowest in the world. And business is excellent. Telcom boasts an annual average return of 35% on investment since its founding in the midst of the civil war in 1994. Last December, Sheikh secured $14 million from his Chinese partners, Shenzhen-based Huawei, to upgrade his service. In total, the Somalian telecoms industry employs 65,000 people. "No taxes, no regulation, no bureaucrats  a total free market where we can do whatever we want when we want," says Sheikh. "Somalia is Adam Smith's dream." But Somalia is also a libertarian nightmare. Private enterprise built schools, universities, postal services and a thriving export trade to the Middle East in watermelons, mangoes and camels. But it also strengthened the hand of the warlords who maintain private armies, private tax regimes and personal interpretations of the law. And without a government to enforce a monopoly of legal interpretation and sanction, Somalia has atomized into its ancient form  a collection of hundreds of clans, sub-clans and sub-sub-clans, making Mogadishu less a city than a collection of tribal neighborhoods. As a 22-year-old Berkeley political science graduate who joined the family firm 10 months ago, Sheikh is keenly aware of what his homeland is missing. "Somalia," he says, "is why you need government." Whether Somalia can rebuild itself as a nation state depends on its ability to create a central government whose power trumps that of any one warlord. And a month after Ethiopia invaded in a lightning advance that ousted the ruling Islamists and installed the centrist Transitional Federal Government (T.F.G.) in Mogadishu, the prognosis has to be: unlikely. The T.F.G. has little popular support inside Somalia and  crucial in a place where muscle counts most  only a hastily reconstituted army of retired soldiers to protect it. The T.F.G. needs help. But from whom? The Ethiopians are no use. Coming from a majority Christian country and an old enemy, the Ethiopian soldiers must go  and fast. Most Somalis view their presence as an outrage, and they are a first, and very vulnerable, target in any gathering Islamist insurgency. Moreover, Ethiopia's successful invasion will have raised the hackles of regional rival Eritrea. The two sides have previously fought proxy wars in Somalia by backing rival warlords, and there is no reason why Eritrea would desist now. The U.S. has also ruled itself out as a source of stability with two AC-130 gunship attacks this month on the remnants of the former ruling Islamic Courts Union (I.C.U. ), holed up in deep forest on southern Somalia's border with Kenya. The targets of the U.S. attack were three al-Qaeda agents suspected of blowing up the American embassies in Kenya and Tanzania in 1998 with the loss of more than 200 lives. In its pursuit of its own narrow  if understandable and perhaps laudable  goals, the U.S. has ignored the radicalizing effect that its actions will have on Somalis. Somalis have a long tradition of moderate, secular Islam and regard al-Qaeda's call to arms against the U.S. and its allies as more exhortations by interfering foreigners. But that could change. Iraq showed how calling someone al-Qaeda and then attacking them can become a self-fulfilling prophecy. Add in the unhappy American experience of Somalia (remember Black Hawk Down?) and existing strains on the U.S. military and intelligence arms, and the chances of Washington proving an effective stabilizer in Somalia become remote. The U.N. might be expected to step in at this point, but it has ruled out a return to Somalia. Which leaves the African Union, which this month pledged 8,000 peacekeeping troops. But whether that force ever materializes is open to question. Uganda has promised nearly 1,000 men, Malawi is mulling a few hundred and the T.F.G. claims to have a commitment from Nigeria. But that's it so far. The new Prime Minister, Ali Mohammed Gedi, pleads eloquently for assistance. He also recognizes that no outside support will be sufficient if his government fails to rise above the clans. "It is a fully inclusive government," he declares. But few buy his rhetoric. "He is not consulting us," says Ugas Abdullah Ugas Farah, chairman of all Somalia's tribes. "That means clanism. And that means the man with the biggest gun is in charge." Mohamed Uluso, a clan leader from the Ayr tribe, adds: "There is no basic trust. The government is not reaching out to anyone. The people are charged to explode." As for Sheikh, he's cautiously optimistic. Business is brisk. And he takes heart from Gedi's background as a promoter of the private sector. But he's also decided to limit his time in Mogadishu to two or three years. His experiences, he says, have given him a brand new plan: "Law school."